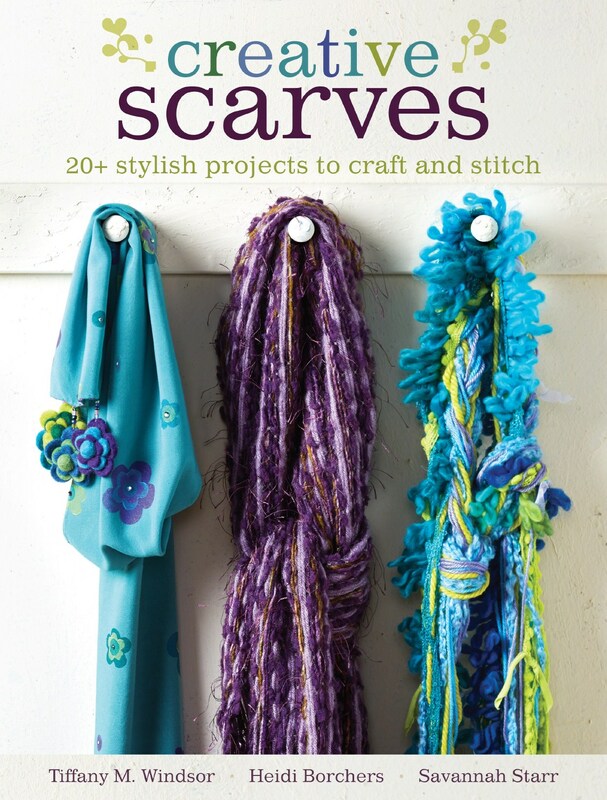 Creative Scarves Blog Hop – You Need This Book! I’m obsessed with scarves. Seriously, I have 2 organizers in my closet completely stuffed with scarves in every color that I love. However many store-bought scarves I have, I still favor the scarf that I made myself. I crocheted a scarf that I love to wear in the winter that makes me feel all cozy. 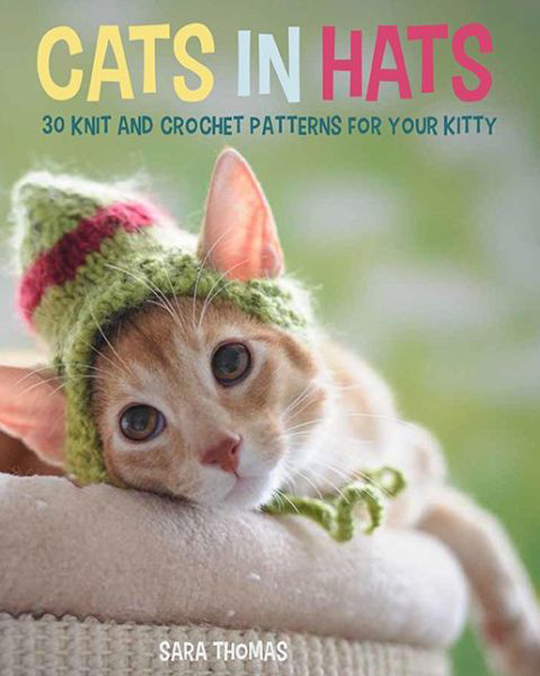 This new book from Tiffany Windsor, Heidi Borchers, and Savannah Starr will be a lovely addition to your crafting books. Just like the scarf I made for myself, you can make your own, completely unique to you, scarf that you’re guaranteed to love. This book is excellent and full of so many ideas for every season! There is literally something for everyone in this book. 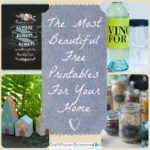 Plenty of techniques are new and exciting – I can’t wait to try “painted plastic printing” and the “block print bumblebee” techniques! Want to win a signed copy of this book and a $100 gift card for Dharma Trading? Enter to win by visiting Tiffany Windsor’s site and check out the rest of the blog hop! Today my fellow editor and I embarked on a lovely sewing adventure! We made this little owl from the new Pretty Birds book. 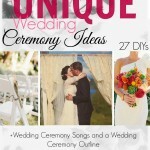 Be sure to check out the Blog Hop for a chance to win our copy of this book! These owls are SEW cute. Learn how to make your own on the blog! Reprinted with permission from Pretty Birds © 2015 Virginia Lindsay, Running Press, a member of the Perseus Books Group. Owls have long represented wisdom and scholarship. There is something about their unique shape and big round eyes that is just so appealing. 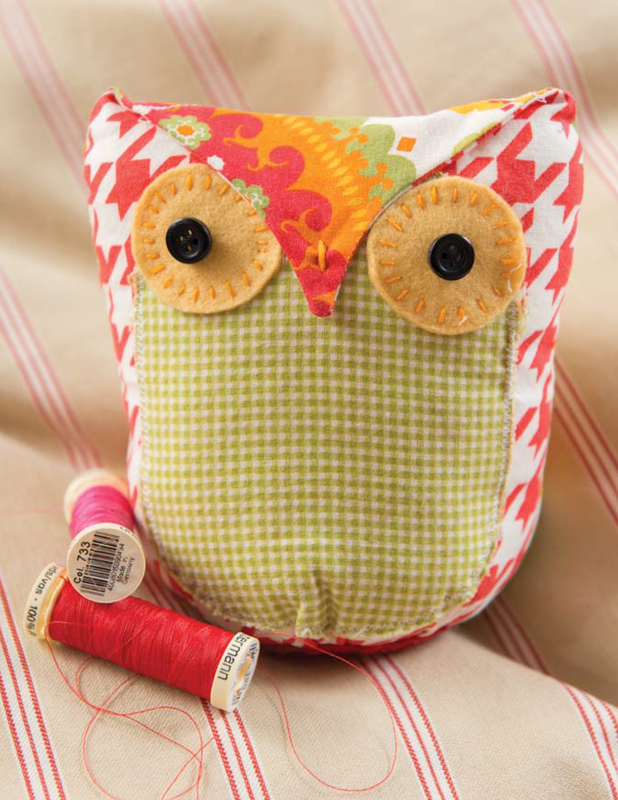 Just one warning note—making fabric owls is addictive. I have been doing it for years and I still love it. These fun little friends are a quick and easy sew, and you can use a variety of fabric combinations. Feel free to use bright and funky colors; the Owl’s shape and features are so distinctive that it’s always obvious what you are making. You can search for all your favorite fabric scraps and use them up for this project. 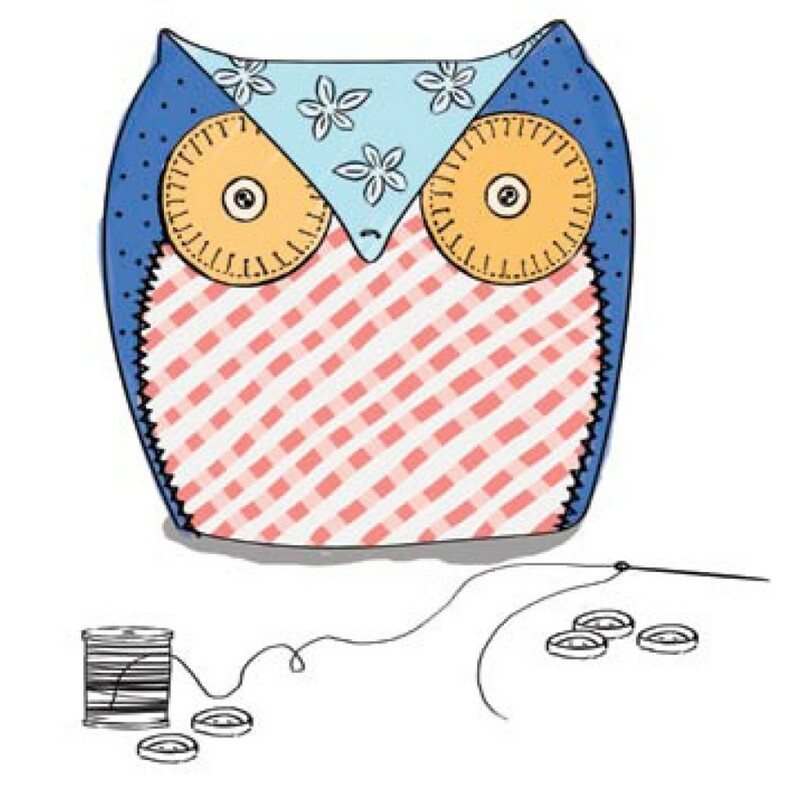 The Owl pattern can be used to make toys, door stops, cable caddies, and fun pillows. Be sure to use good-quality wool felt so the eyes and base do not become spoiled after a few big owl hugs! Zigzag stitch the belly piece onto the front body. Switch back to straight stitch and sew on the felt eyes. 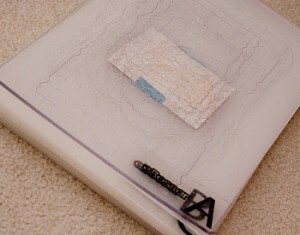 To handsew, use blanket or overcast stitch then running stitch. The pattern piece has a placement guide to help you. Pin the front and back pieces right sides together. Leave the base open but sew up the side to the point and then back down the other side. Trim the seams down and then clip the fabric at the tip. Turn right side out and press flat. The pattern piece has a guide for sewing the ears. Do this with the sewing machine by marking with pins where you want to begin and end and then just sew a curve above the eyes. Stuff the Owl with polyester fiberfill. Knot the end of a piece of thread and then sew a running stitch around the base of the Owl. Gently pull the thread to gather the fabric together. Secure the gathered fabric with a strong knot. Handsew on the base felt piece to cover up the gathered fabric. Use matching embroidery floss and a simple running stitch to secure the felt onto the base. To finish, sew the button eyes in place and sew the beak down with a couple of stitches. You can really make the eyes stand out by doing a simple decorative stitch around the circumference of the eyes. Because of its shape the Owl is perfect to transform into a small hot-water bottle cover for chilly nights. Consider using heat-insulated batting to give your hot water bottle longer-lasting warmth. 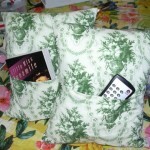 You could use flannel and minky fabric for the exterior pieces to create an extra cozy bottle cover. Turn to page 121 for additional templates, QR codes, and full instructions. Add a simple pocket to the back of the Owl. Use a scrap of fabric 6 ¼ x 9 in. 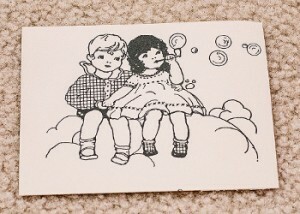 (16 x 23 cm) to make a piece that is 6 ¼ x 4 ½ in. (16 x 11.5 cm). Fold the fabric in half lengthwise, wrong sides together, to make a pocket. Line it up with the base of the back piece and tack it to the sides. In Step 3, sew through the pocket layer when you sew the front and back sides together. Finish the Owl as usual but now you will have a nice little pocket in the back. Keep it on your desk next to your computer! We love this little owl! Who would you make one for? A little birdy told me that there’s a new sewing book out that you don’t want to miss! 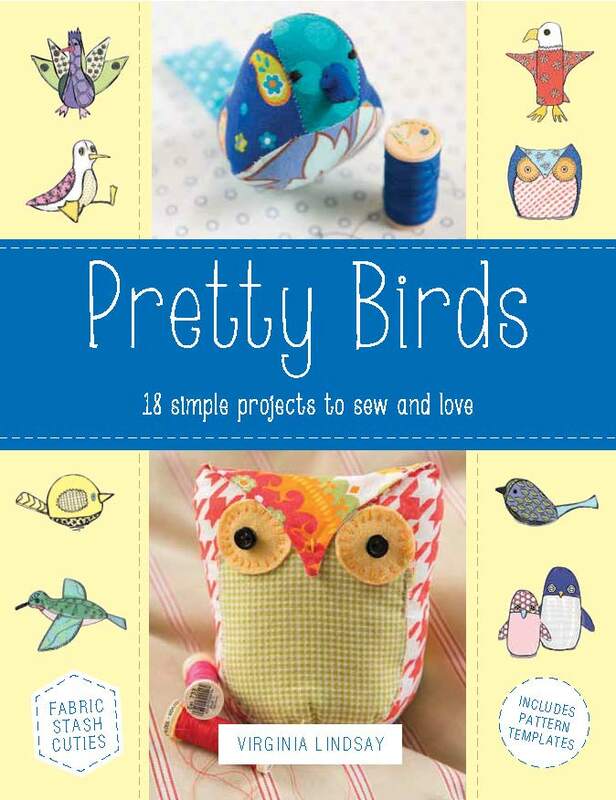 Pretty Birds: 18 Simple Projects to Sew and Love is a brand new book by Virginia Lindsay from Running Press. We’re in love. This book includes pattern templates for all 18 birds and amazing illustrations by Jess Herbert. Each bird was beautifully photographed by Ivan Jones and with each page I turn in this book I am itching to sew each and every bird! They are all so whimsical and, just as the described in the book’s title, simple. Sewing patterns don’t have to be complicated to be beautiful and this book is proof. 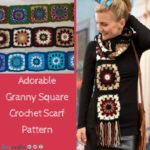 One neat thing about this book is that each pattern comes with “other ideas to try.” We love this because crafters love options when it comes to creating something. Keep each pattern as is or switch it up a little bit to turn a bird into pencil holder, a gift topper, or a kitten toy (to name a few). Plus, these little birds are great stash-busters and great for using up fabric scraps. I decided to try my hand at sewing one of these pretty birds. Can you guess which one I am going to try? Come back to the blog tomorrow and you’ll get to see which pattern I tried PLUS get the pattern from the book for free! Join the fun and follow this blog hop! Want to win a copy of this lovely book? All you have to do is answer this question! What is your favorite bird and why? Thank you all for participating in our giveaway! Congratulations to Laura S. who answered, “My favorite bird is the Eastern Bluebird. They are so pretty, especially the males, and they are great just fun to watch. 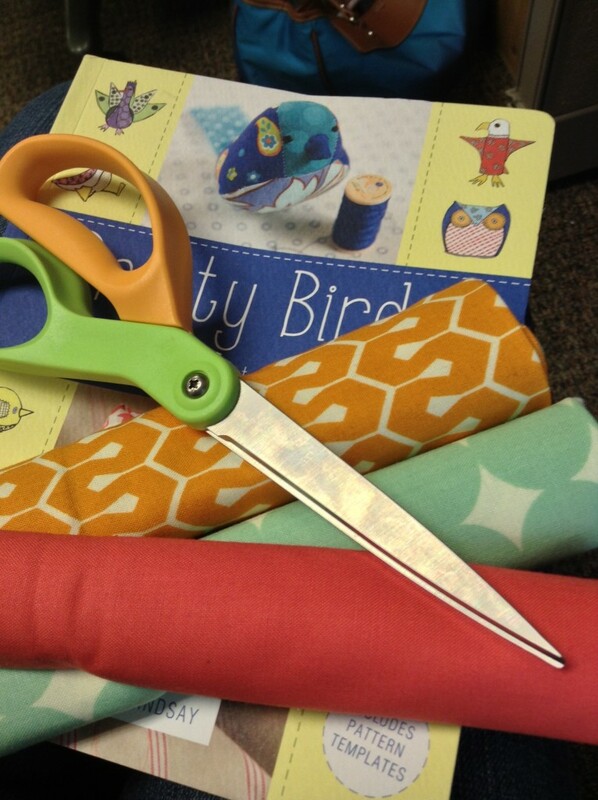 The first set of babies to hatch in the summer will usually hang around with the parents and help them raise a second batch of babies later in the summer!” Get excited to sew your very own little bluebird with your new book! Winners will be announced here on this blog post on March 12, 2015 as well as contacted by the email address provided. You have until March 11, 2015 at 11:59p EST to leave your comment. Comments posted after that will not be counted. Thanks to everyone who participated in our Christmas Craft Show & Tell! We challenged you to share your best Christmas projects with the FaveCrafts community. For the last two days, blog readers have had the chance to vote for their favorite project. 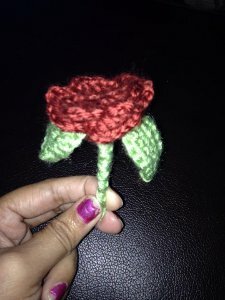 Joan submitted a crochet rose! Head over to Pinterest to view more of her work. Thank you to everyone who linked up for this hop! You can see all the submissions and find great holiday craft tutorials by visiting the Christmas Craft Show & Tell post. We’ll see you back here for the next blog hop! Christmas Craft Show & Tell: Cast Your Vote! Thanks to all of the talented crafters who have shown off their amazing Christmas creations so far – we’ve received some really awesome entries! Now it’s time to vote for your favorite project. Cast your vote below and help us decide who will receive this fantastic craft prize package! Voting ends Friday December 13th 11:59 p.m. EST and a winner will be announced on Monday, December 16th – be sure to cast your vote before it’s too late. ***Also, share this post so all of your crafty friends can vote for their favorite crafts, too! Show & Tell: What Are You Crafting For Christmas? Welcome to our Christmas Blog Hop! What festive holiday crafts are you making? Show us your latest and greatest Christmas crafts and holiday creations from the month, or make something and write it up just for the occasion! From now until December 11th, you’ll have the chance to post your latest Christmas crafts in this very post. On December 12th, voting will begin and readers will have a chance to pick their favorite craft. The person whose project receives the most votes by 11:59 p.m. on December 13th will also receive the crafty prize package shown below! The winner will also be announced on the FaveCrafts Blog as well as on our social media pages. Create or find a blog post on your own site that showcases your Christmas project. 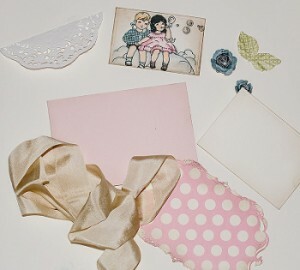 In the post, you can talk about the crafting process, write up a tutorial, or merely show off the finished project. Add your link by clicking on “Add your link” at the bottom of this post and follow the instructions. Make sure you link to your specific blog post, not your homepage, and give it a caption. Remember to copy the FaveCrafts Blog Hop button from below and paste it into your blog post. 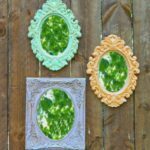 Also, link it to this Blog Hop post, so that everyone who reads your blog can see that you’ve been featured on FaveCrafts! Remember, the link list will close at 11:59 PM on December 11th. At that time, no new links can be entered and voting will begin. **Want to be notified via email about future blog events? Tell us you want to be added to our Blogger List and we will let you know when the next Blog Hop is up so you can join the fun! On September 17th at 1 pm EST , Craftwell will unveil the brand new Theresa Collins eBosser on the Home Shopping Network. 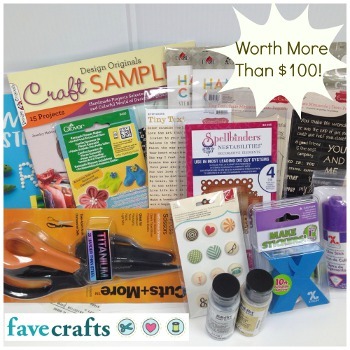 In anticipation of this exciting event, FaveCrafts is participating in a celebratory blog hop! 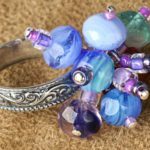 Be sure to scroll down for a list of participating craft designers and sites – we’re in great company! We asked one of our top craft designers, Michele Kovack from Thoughts of a Cardmaking Scrapbooker, to create a card using the eBosser and we’re so excited to share her finished design. Hi! 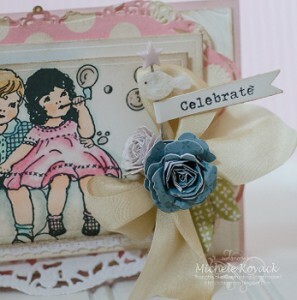 Michele Kovack here with a tutorial for my vintage-inspired card! I love to use die cuts and embossing to give my projects for greater depth and interest, and my eBosser is perfect for both of these! I have to admit it, but I can be a lazy crafter. I hate having to turn the handle each and everytime I cut something out. I am also a multi-tasker, so while it cuts for me, I can walk away and do something else! I love that! So let’s get started, shall we? 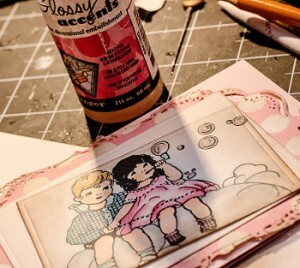 I love the image of these two cuties by Crafty Secrets. 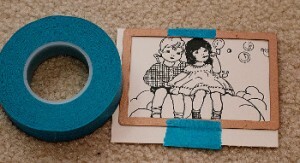 When I am die cutting, I often use artist’s tape to hold the die in place. Nothing aggravates me more than having that little die shift while it’s cutting! I turned my machine on and feed the plates through. I wanted to matte my image with this fun polka dot paper, so I chose a pretty Spellbinder’s die. I colored my image, distressed it and added crystal effects for the bubbles. 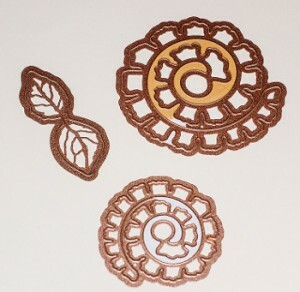 I love using flowers as accents and used these flower dies from Spellbinders and ran it through the eBosser once again! Here are my pieces laid out in front of me. Now it’s time to assemble the card! 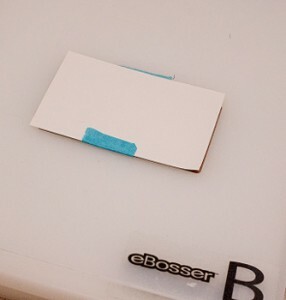 I love how easy it is to cut and emboss with the eBosser! I have had other machines, but this one by far is my favorite! 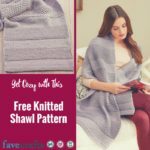 In addition to the Blog Hop, Craftwell is hosting an awesome giveaway! 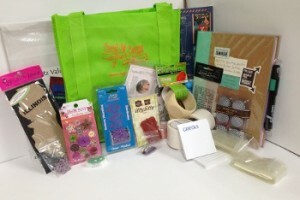 You could win a Theresa Collins folder or eCraft ToolKits. 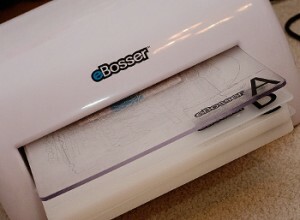 Additionally, one lucky crafter will even receive a Theresa Collins eBosser! The first 250 people to leave a comment on EVERY Theresa Collins eBosser Blog Hop post (including this post and one from each of the bloggers below) will be entered for this giveaway. The drawing for the winners will be revealed on October 1st on the Craftwell Blog. Thanks to everyone who participated in our Earth Week Blog Hop! We challenged you to share your best eco-friendly projects with the FaveCrafts community. For the last four days, blog readers have had the chance to vote for their favorite project. 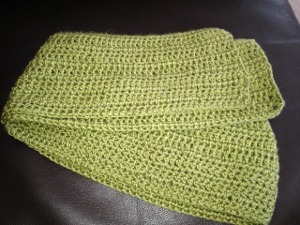 Pavithra submitted this crochet crochet scarf! You can find the full tutorial on her blog, My Crochet. Thank you to everyone who linked up for this hop! 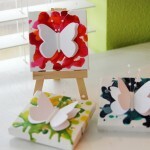 You can see all the submissions and find great spring craft tutorials by visiting the Earth Week Blog Hop post. Earth Week Blog Hop: Cast Your Vote! Thanks to all of the talented crafters who have shown off their amazing eco-friendly creations so far – we’ve received so many amazing entries for our Earth Week Blog Hop! 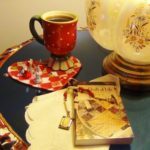 It’s time to vote for a Blog Hop winner! Cast your vote below and help us decide who will receive a fantastic craft prize package! Voting ends Monday April 29th at 12:59 p.m. and a winner will be announced on Tuesday, April 30th – be sure to cast your vote before it’s too late.